Moving isn’t easy. Although you probably already knew that. Here are some pro tips to make it easier and so you don’t run into any unforeseen issues in the process. First you’ll need to make sure you’re ready for the big move-in day. Don’t delay... Start putting things in motion after you sign your lease. Many buildings have specific days and hours during which they allow tenants to move-in. Set your move-in date as quickly as you can and block that day off on your calendar. First understand if you need a moving company or not. If yes, you will have many options here, so shop around. Find the right price point and the right sized-team to handle your move. Get a flat rate for the day, rather than paying per hour. If you’re moving yourself, or could use some extra help, check out Bellhops. COI = Certificate of Insurance. This you will need to get from your movers. It’s a standard request and something that is typically required by your building’s management. 4) Have a way in. This seems like common sense, but you would be surprised. Get your new keys ahead of time. If you can’t, make sure somebody will be there that day to let you in and hand them over. You don’t want to move in to your new place and not have heat, air conditioning, or even — Netflix. Oh, the horror! Ask your building if they have recommendations or preferred vendors for cable & internet, as well as heat & electric. Boxes are everywhere — you don’t have to pay for them. Ask around your office and check local businesses to see if you can get some that will be thrown out anyway. You don’t need a ton of boxes either. First use the suitcases, duffle bags, hampers, backpacks, and even garbage bags that you already have. The same goes for bubble wrap. Wrap breakable items in clothes to protect them. Finally — take this opportunity to purge your belongings. Donate things, sell them, or simply throw them away. Now is the perfect time! If you’re really ambitious and want to make your time unpacking more efficient — you can label, number, and/or color code your stuff so you know what is where as you settle in. Here are some more tips on packing for a stress-free move. Nervous? Okay, yeah, you shouldn’t be. Prepare yourself for a long, hard day and — who knows — you could be surprised at how easy it was. A small backpack or duffle will do. Make sure you have the essentials. Pack food, water, a change of clothes, some cleaning supplies, your keys, and money to pay the movers. You can also use this space for specific items you want to handle yourself — like a laptop. Before you start moving things in, make sure you inspect the new place for any issues. Look for scratches on the floor or walls, broken appliances, and anything else that could be wrong. Take pictures and report it on that day (or at least within the first week). Once that’s done, do a solid cleaning of your room. Odds are you won’t be cleaning much behind your bed once it’s in there. Start fresh with a brand new place. 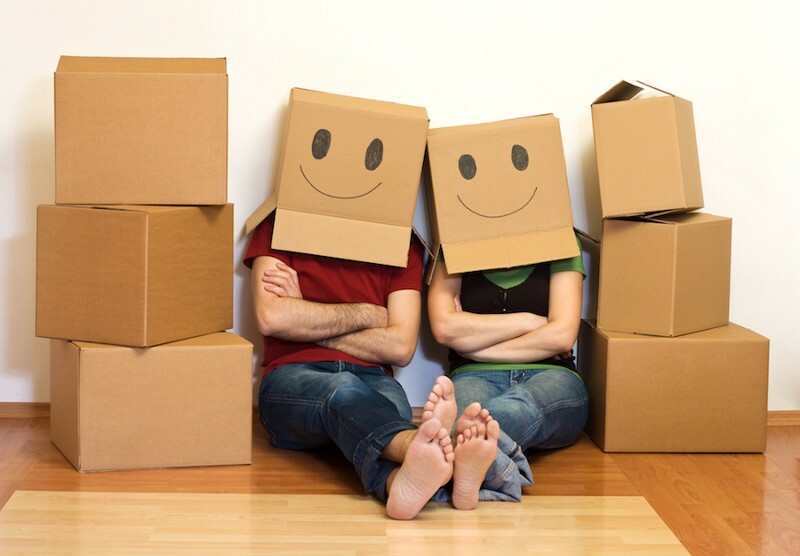 For vacating your current place, here are some tips. Oh right — that. You won’t want to, but get as much as you can done that day. You certainly won’t feel like doing it any other day and you may start living in a room full of boxes. 10) Change Address. Get Cool Stuff. When you change your address, you will start getting coupons on the mail for stuff you need. 10% off a new TV, $50 off a new mattress, etc. By using Moved you will have access to all of these discounts (and a ton of personalized help!) as you go through the moving process. And that’s it! Simple right? Well, it can be a bit hectic but follow the steps above and you’ll tackle moving day like a champ.